Many years ago, before our paths crossed, we were each asked to become members of different Rotary clubs. 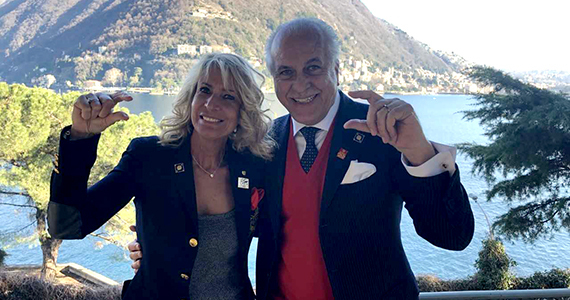 We were honored to be asked, since we felt that Rotary would be a great container for many things: friendship, culture, learning, international connections, and most of all Service Above Self. Each of us went on to serve different roles in our clubs including club president. There have been moments of discouragement and misunderstanding for both of us. But always, the reward of doing service would outweigh momentary difficulties. 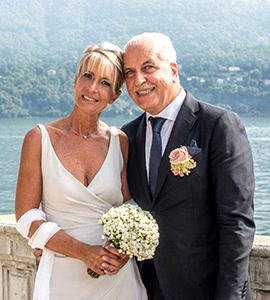 Roberta Peverelli and Filippo Arcioni on their wedding day. After we met, and when we eventually decided to get married, it only took looking into each others eyes for an instant to decide how we would incorporate Rotary into our wedding. We decided to ask our friends to make us happy by making a donation to PolioPlus as wedding gifts. We were married 20 September 2018, and our friends responded with such great generosity that we were able to raise more than $30,000 for PolioPlus. It is amazing how much joy one simple decision can bring, and we are thankful to have been able to celebrate in this way with our friends one of the most beautiful days of our new life together. We are also reminded of all the things we were able to avoid: long discussions on the wedding list, stores to visit, gifts to chose and to avoid receiving!! We invite other Rotarians to consider collecting donations for PolioPlus to celebrate the beautiful events in their lives. Naturally, it doesn’t just have to be weddings. The joy you experience will be coupled by the knowledge that you are helping rid the world of polio and save children from this crippling disease.